DeMarcus “Boogie” Cousins is arguably one of the most beloved characters in Kentucky Basketball history (at least during the Cal era). His goofiness alone made him a fan favorite, but his play has always been something else. From his last second tip-in to tie to SEC tournament against Mississippi State and then running to celebrate with John Wall in a pile, to Cousins joining the Warriors becoming another villian on the already stacked, back to back Champions. Cousins has never been shy of admitting why he joined the Warriors, stating he wanted a ring and he is also best friends with Draymond. Everything was going well until last night: the curse of the Boogie. A little background of the curse… Kentucky in 2010. Kentucky was the #1 overall seed in the NCAA tournament and lost in the Elite 8 to West Virginia 73-66. The game alone speaks volumes for the curse, because a team that always shot above 30% from three shot 12% in the Elite 8. Kentucky went 4-32 for the game and thus the curse began. Since then, Cousins had not made the playoffs or honestly played a meaningful game… until last year. Anthony Davis and Boogie, two of the most beloved Kentucky athletes in recent history, joined forces in New Orleans to try and make some noise. Well, they did just that. The Pelicans were legit last year. With Jrue running the point and a healthy AD/Boogie, they could have beaten anyone… well until Boogie tears his achilles and has to miss the rest of the year. The Pelicans swept the Trail Blazers but got swept by the Warriors thus ending their hope. With Boogie it would have been different, they could have won the title but curses are curses. Lastly, we come to this season. Cousins coming off his injury, signing with the reigning champions, and plays in his first ever career playoff game. He scored 9, rebounded 9, and fouled 6. So not a good showing for him. Bounce back, let’s get it in Game 2. 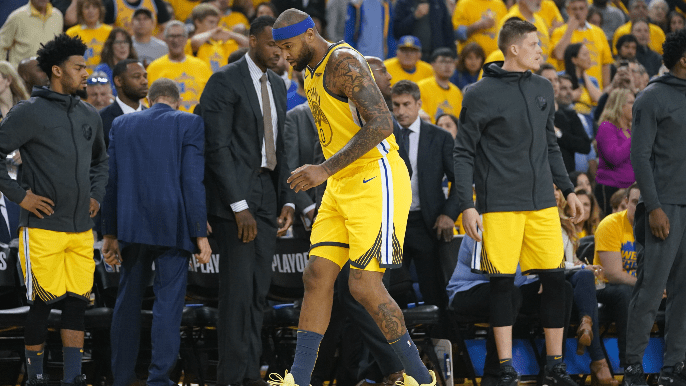 Well, Game 2 comes and 4 minutes in, Cousins gets hurt with a quad injury. Not only does Cousins get hurt, his team blows a 31… yeah you read that right… 31 point lead to the Clippers and lose. Their second loss after the numbers 3 and 1 show up (s/o JR Smith). Demarcus Cousins is a cursed man. Not only is he cursed, but his teams always seem to be cursed with him. Kentucky lost in 2010, the year they should have won. Never making the playoffs with the Kings and now they’re having their one of their best years in their franchise. The Pelicans lose out on their best chance they’ll ever have. So what’s next? With Cousins going down with a season ending surgery, my prediction is the Warriors lose next series to the Rockets. Because with Boogie Cousins, you’ll be cursed.